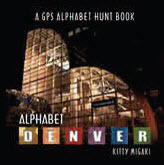 CIPA Member, author, photographer and publisher, Kitty Migaki, presents her new book Alphabet Denver ‐ A GPS Alphabet Hunt Book. The book is 64 pages of eye‐catching photos of the ABCs formed in Downtown Denver Architecture at locations we all visit, including the Denver Art Museum, the DCPA, and the stadiums. There are 25 original tongue‐teasing poems and, best of all, Kitty has included the longitude and latitude of each letter location, so you can take the kids/students and go on a letter hunt around town with a handheld GPS. No GPS? No problem. There is an address cheat sheet in the back. Alphabet Denver won a prestigious Moonbeam Award from Independent Publisher in October.